Basic guidelines for rotary or barrel tumbling: Use chips, small stones, small or broken slabs or preforms (shaped, sawed stones such as triangles) for tumbling. Remove oil from broken slabs by washing in soap and water. Rocks in one batch should be of the same hardness in the tumbler, such as agates and jasper, or onyx, or obsidian, etc. At least 20-25% of the barrel load should be rocks or filler of 1/4-1/2″ size to speed the tumbling process. This is called separation or filler material. (Use ceramic media, wood chips, saw dust, bits of rubber, leather, rock chips,etc. Fill barrel 3/4 full of rock and separation material. (Low volume of stones in a tumbler means stones will mainly slide along the bottom of the tumbler. Add 1 tablespoon of abrasive grit per pound of material in tumbler. Note: obsidian should have 50 to 75% filler such as ceramic media to keep from chipping or spalling the stones. Note keep barrel at all times at least 3/4 full. Normal grit stages for harder stones are coarse:60/90 or 80, medium:150-220, fine:500, then polish. (400 grit step optional). Tumbling experts recommend a grit step with aluminum oxide, pre-polish/800 grit just before the polish step. Add your stones and separation material to the tumbler then add water to about 1-2″ below the level of the rock. Coarse grit stage may take 2-4 weeks, but possibly 6-8 weeks for hard agates and jaspers. Add new coarse grit weekly, 1 tablespoon per pound of rock. (Coarse grit breaks down quickly). The other grit stages take about 1-2 weeks each. Check weekly. (Use sticky labels to date and record grit size on the tumbler.) When most of the stones appear ready for the next stage, remove those not ready and run again in the next coarse batch. If any stones have broken, do not add these to the next grit sequence or they will scratch the stones. When changing grit, thoroughly clean stones, by pouring stones on an elevated fiberglass window screen and spray the grit off with a garden hose, and rinse again. Winter tumbling, may call for a number of buckets and a colendar for rinsing the stones. Do not use the kitchen sink to wash your stones, grit will clog the pipes. Grit that is left in vugs or crevices will contaminate the next batch if not removed. Clean barrel and lid thoroughly. Proceed to the medium or 150/220 grit stage. Try starting the tumbling process for soft stones such as onyx and obsidian at the medium grit stage. Only one dose of grit at one tablespoon per pound of rock is needed for all other grit stages. Check weekly for one to two weeks. Hand shaped stones or cabochons ground through 220 can be added to the tumbler barrel starting at the 400 grit stage. (Little stone is removed from this stage on.) For normal rounded rock polishing, use a tumbler polish such as TXP. (Use one Tab. per 10 pounds of rock.) If polishing flats, such as small slabs, use Rapid Polish #61. Other polishes use 1 Tab. per pound of rock. Felt fabric sheets can be cut into 1/4″ to 1/2″ by 1 1/2″ strips with a ROTARY CUTTER to aid in polishing. Rinse and use again in the next batch of polishing material. Check the load after 3-4 days, but it may take a week or two of polishing. Wash and dry a few stones and if they look as good dry as wet, polishing is complete. NOTE: When tumbling APACHE TEARS, use only Apache tears, do not combine with other obsidian. Rough grind in 220 grit with plenty of ceramic media for cushioning, then tumble in 500 grit. (All grit stages need ceramic media) Tumble until a semi-polish is apparent. Polish with tin oxide. A final BURNISHING step is recommended for Apache tears or any obsidian. Mix water and a powdered detergent (Tide was recommended, or grated Ivory bar soap at 1 Tablespoon per 3 lb. barrel) and run for about 10 hours in the tumbler. Keep a journal and record your procedures for a reminder on the procedures used and what worked. 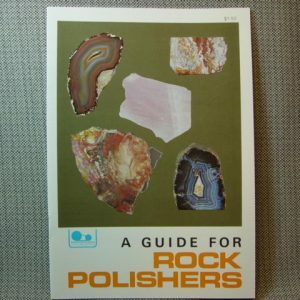 See more info at Assorted Lapidary Tips.